Maybe you have read the rules for playing Marauders of Chaos warbands in the current issue of Letters of the Damned (#2). I recently started to build such a warband myself (after we've been playing with crappy models for over 3 years) and thought I'd share it with you folks. So here we go! First I built a few marauder henchmen. I tried to give them some dynamic poses and an individual feel. I also gave them some additional bags and pockets because I think the members of a Mordheim warband are like wandering adventurers and they will always have their possessions with them. The marauders are no exception from this. This marauder is the typical close combat warrior, ducking behind his shield as he advances to the cowardly enemy shooters. What I also needed was the Champion of Khorne base as the mantle of the Archaon body is really huge. ps: I was running out of 25mm bases so I had to use one of my remaining unfortunately painted ones. But oh well, whatever.. Finally I opted for the second one because - although the first did have a better SPawn of Chaos feel, which is what the Condemned is all about - I found the second head to be much more impressive when put on a human body (at least that's what I imagined). When I received the CSM daemon head I was a bit surprised. It was even bigger than I expected. Because of its size I couldn't just put it on top of a marauder body. I had to model a longer (and thick) throat for the model. So I was forced to use Green stuff for the first time ever. Next thing the Condemned needed were arms that represented an apropriate pose. As I envision the Condemned as a really cursed and tortured model I wanted to have it raise its arms to the sky. Showing the pain it is going through. This required me to organise other hands than the weapon-wielding ones the maruders have. I found these in my bits box: Zombie hands and arms. So after a bit more cutting, rasping and gluing I finally had my Condemned! Oops, wait! I almost forgot one thing: The model was still appearing a bit "empty". Therefore I added a horn to his back. My favourite resource for horns is the goblin bow arms from my bits box. So that was some more cutting and gluing but then I had my Condemned at last. So what I still need are a few Champion models and a Shaman. I don't like any of the Chaos Sorcerer models for a Shaman so we'll see what I do. Until next time, enjoy the pics! UPDATE: The finished warband can be seen starting with this post on page three. Enjoy! Cool idea's! I'm still deciding wich Warband i want.. Cool poses, espacially the last ones are great! Well, I have to say that I don't like the look of the chaos marauders in general, simply to comic-like for my taste with their over-sized weapons, horn-helmets and mountains of muscles(You know what I mean- Conan, Thrud and so on ). I'm afraid it'll take some time until I begin the paint job as I have a lot to do. Moreover, I want to collect the whole warband before starting it. Kudos Cianty! This is an excellent conversion/modellism report! I read it with great delight! I like your conversions too, and actually i don't really have a problem with the Conan look... I think it's ok. I mean the skaven look a bit caricaturesque too, don't they? And they are still cool models. Could you maybe post a linkt to the warband rules for marauders? I would like to read them (have never heard of it...). Thanks! But still, they are great models, that's for sure. Yes, but the Chieftain is no wimpy human warrior. He's more like Conan after drinking Asterix' magic potion. Get the picture? You're welcome! Please don't hold back with any comments/ideas/whatever that come to mind. EDIT: Sorry for the broken links. You can see the models in the updated initial post or on the BTB website gallery. Although I DO look down on buying conversions on ebay (just kidding!!! ) I have to say they look really great! Especially the first one! What are they made of, it looks like plastic? No, he uses a grey coating after converting. He does use plastic, metal and green stuff but you can't tell from them afterwards. Ah ok, I was wondering because of the colour. I am thinking about what I could use a Shaman model. The Warhammer range of Chaos Sorcerers doesn't have an adequate model. Even among all the older models from Citadel I can't find anything I like. Does anyone of you have any suggestions how to make a good conversion for a marauder shaman? What model should I start with? How can I give it a more shaman-like look? So far, I don't have a better idea than just using a normal plastic marauder, giving him a staff with a skull or something and trying to use green stuff to give him a fur for his head... if you get what I mean. Any ideas? Although I have no idea what model to use, I would suggest to give the shaman a wolf-fur, so that he uses the wolf's head as a hood. How about using the "Valten, champion of Sigmar" model? 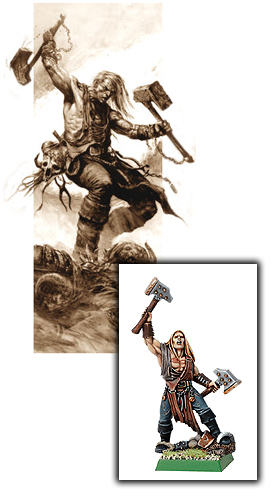 You could, as Erkwin suggested, add a fur coat and replace the hammer with axes. Yes, I was also thinking of something like this. I don't know if my green stuff skills are ready for something this difficult. I like the Valten model. But I don't know if it is really appropriate because the marauders are way bigger than normal humans. I think Valten should work, he looks very muscular.